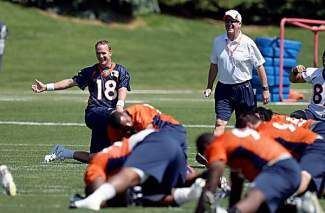 When the Broncos reassemble next month for training camp, they will arrive at team headquarters as Super Bowl contenders, one of the NFL haves on the inside track for a shot at the trophy. That expectation will follow them through every practice, every game, of the 2013 season. “If you’re good, I mean really good, you deal with that,” said Hall of Famer Shannon Sharpe. “One of the best things our second Super Bowl (championship) team did (in the 1998 season), we knew we were the best team, knew it from the time we stepped on the field in training camp, and we still did the work, we still put in the time, we still did things like we hadn’t won a thing.